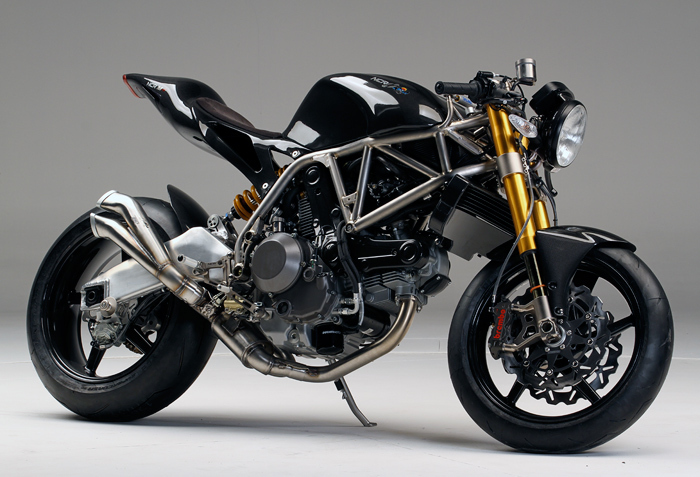 NCR based in Bologna, Italy is a designer and manufacturer of ex-clusive motorcycles and performance parts that are race circuit tested and use the highest available technology and leading edge design. Origionally a race shop founded by 3 previous Ducati employees, NCR becuase the offical back door racing shop for Ducati in the 1960s - 1980s before there was an official Ducati Corse race team. In 2001, when the founders retired, the Poggipolini Group, a world leader in the processing of exotic lightweight alloys as Titanium, Magnesium, Aluminum and special steels, and a leading supplier of products and solutions for Formula 1, MotoGP, Aeronautics and Marine industries, continue the NCR evolution and mission. In 2005 NCR was authorized as a motorcycle manufacturer and begins building its first complete units. For more information on NCR visit www.NCRFactory.com. 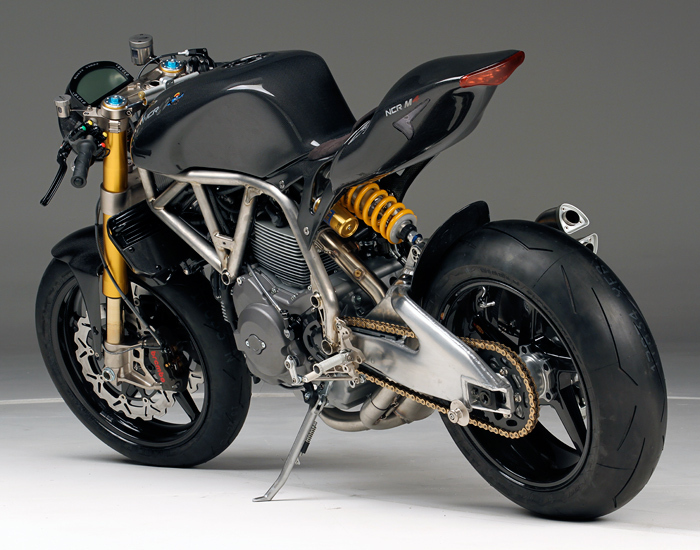 NCR M4 with optional carbon fibre tail section. Bologna, Italy, October 3rd, 2011 - NCR announced a new street legal motorcycle being ho- mologated, initially, for the US market and then for the European and other markets. The new NCR M4 derives from years of building and racing the NCR Millona to many victories and championships in many countries. The Millona is known for it's light weight and amazing han- dling. Using the same basic geometry and concept, the M4 was de- signed to be as light or lighter in street trim than the original Millona was in race trim. 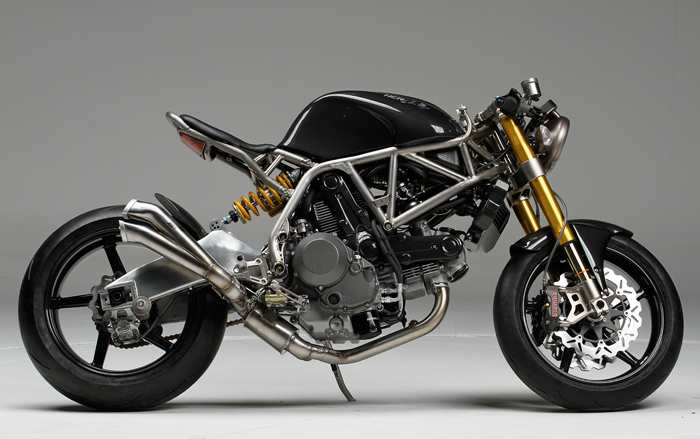 NCR M4 with standard titanium rear sub frame. The air cooled NCR M4 comes with a titanium frame and subframe along with carbon fiber tank, wheels, instrument cluster, airbox, oil cooler housing and fenders. An innovative central electronic package allows for quick disconnects by way of top grade military connectors along with access to many features by way of an USB computer inter- face and software. 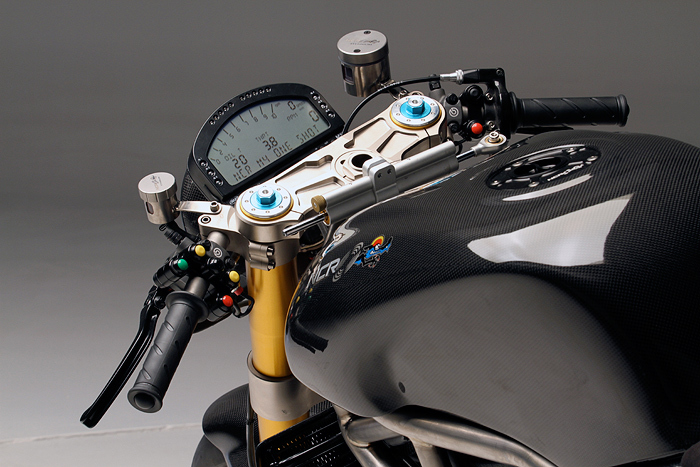 NCR exotic parts like billet triple clamps, fork bot-toms, rearsets along with Brembo radial controls and calipers and Ohlins suspension front and back add to the impressive list of features. The NCR M4 has a MSRP of $49,900 US plus applicable taxes, shipping and dealer preparation. Expected first deliveries in Spring 2012 (for the US market). 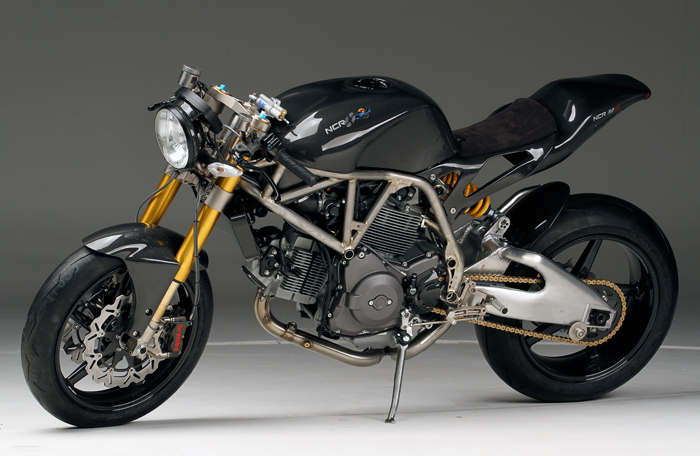 The NCR M4 has an air-cooled 1100cc Ducati EVO engine and pro- duces 107 hp at 7,500 rpm, torque of 84 ft-lbs (115 Nm) and a weight of 286 lbs (130 kg) with oil and battery. MSRP of $49,900 US plus ap- plicable taxes, shipping and dealer preparation (for the US market). The NCR M4 One Shot comes with an NCR 1200 modified Ducati EVO 1100 engine, complete with billet stroker crank, titanium connect- ing rods, titanium hardware throughout and NCR-EVR slipper clutch. The NCR M4 One Shot produces 132 hp at 8,700 rpm, torque of 105 ft-lbs of torque (143 Nm) and a weight of 278 lbs (126 kg) and has a MSRP of $69,900 US plus applicable taxes, shipping and dealer preparation (for the US market). NCR aims to redefine motorcycling by setting a new standard in light weight, simplicity and pureness of design and technology. “It is difficult to describe what a 278 lbs, 1200cc street bike feels like because it is not like anything you have tried before. After riding a NCR M4, it is dif- ficult to enjoy riding a motorcycle weighing 100 to 150 lbs more, re- gardless of the amount of horsepower it may have,” said NCR M4 de- signer and NCR C.O.O., Joe Ippoliti.